Marussia and Caterham "may not be the last" teams to suffer from the high costs of racing in Formula 1, according to former FIA president Max Mosley. 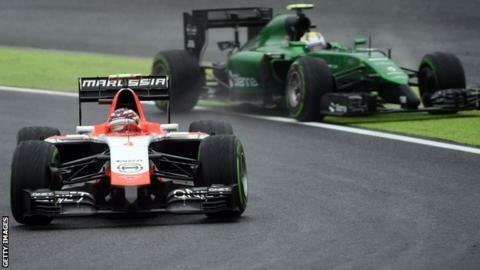 Marussia were put into administration on Monday, just days after Caterham met the same fate. Both will miss this weekend's US Grand Prix in Austin. "It's not a fair competition any more," Mosley told BBC Radio 5 live. "The big problem is that the big teams have so much more money than teams like Caterham and Marussia." The 74-year-old, who was head of the sport's governing body between 1993 and 2009, added: "In the end, they [teams such as Caterham and Marussia] were bound to drop off - and they may not be the last." Marussia and Caterham's absence will leave only nine teams and 18 cars on the grid, the first time that has happened since Monaco in 2005. The likes of Red Bull, Ferrari and Mercedes spend more than £200m a year on their F1 programmes, whereas outfits such as Marussia and Caterham, who have been at the back of the grid since they entered the sport in 2010, exist on a third of that. Mosley's plans for a cost cap in 2009 fell through and revived plans for one to be introduced next season collapsed earlier this year. "From a sporting point of view, the sport should split the money equally and then let the teams get as much sponsorship as they can," added Mosley. "A team like Ferrari will always get more sponsorship than Marussia, but if they all get the same basic money, then they all start on a level-playing field, particularly if you have a cost cap where you limit the amount of money each team is allowed to spend." This season has seen the introduction of new environmentally-friendly engines, which have more relevance to the road car industry but are double the cost of the previous units. Mosley believes it's not a coincidence that some of the smaller teams are struggling following the increase in engine costs. "I'm in favour of the greener engines," he said. "The mistake was not saying to the big manufacturers that you can spend as much as you want on research but the maximum you can charge per season is something like £3-4m instead of the £15-20m, which I believe it is now." Mosley added that while having 18 cars on the grid is not damaging in the short term, "in the medium term, you will have a problem" because there is "something fundamentally wrong". The bigger teams have clauses in their contracts stipulating that, if the number of cars on the grid falls below a certain threshold, they have to supply a third car. Mosley does not think it would be a good idea, adding: "You should have 10-12 two-car teams and the rules should be arranged so that if someone is a really good engineer starting at the back, they can work their way up to the front."